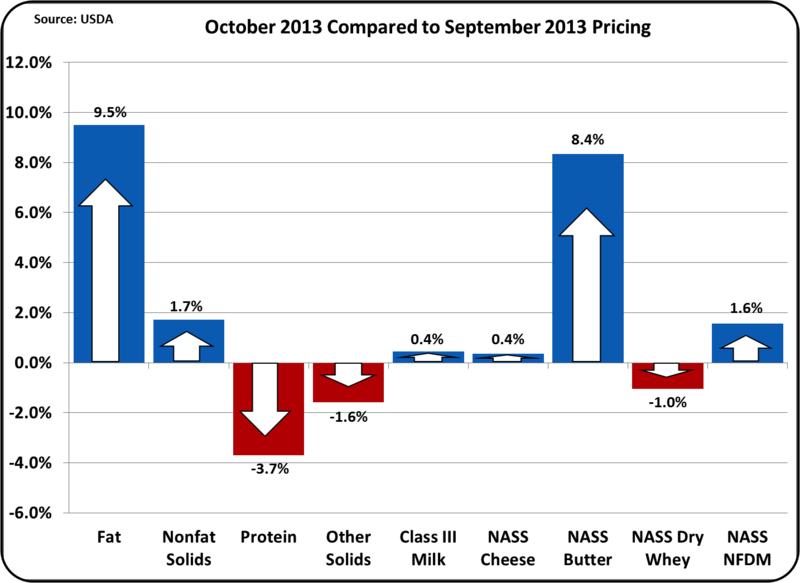 On October 30, Class and Component Prices for the Federal Milk Marketing Orders were announced for October 2013. 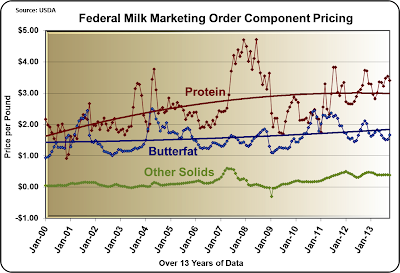 Since the government shutdown, the Marketing Order web site has not been fully updated, but when this is updated, the pricing details will be available on the Milk Price Announcements, Summaries, and Product Prices web page. For the next few weeks, the October announcement will be available at the "most recent" report link. This month's announcement is a slightly abbreviated format. The Class III Milk Price was up slightly at $18.22/cwt. Protein and Other Solids were down slightly and butterfat was up significantly. The Nonfat Dry Milk price did increase, thereby increasing the Class IV Milk price. This will have a positive impact on Class I Milk prices and the Producer Price Differential (see the October 6, 2013 post to this blog for an explanation of these formula driven interactions). October pricing is consistent with long-term trends and future expectations. Protein remains above the trend line indicating an expectation of an improving trend and butter is below its trend line indicating a change to a level more consistent with long term expectations. The pie chart of component contributions to the Class III price remains consistent with recent values. 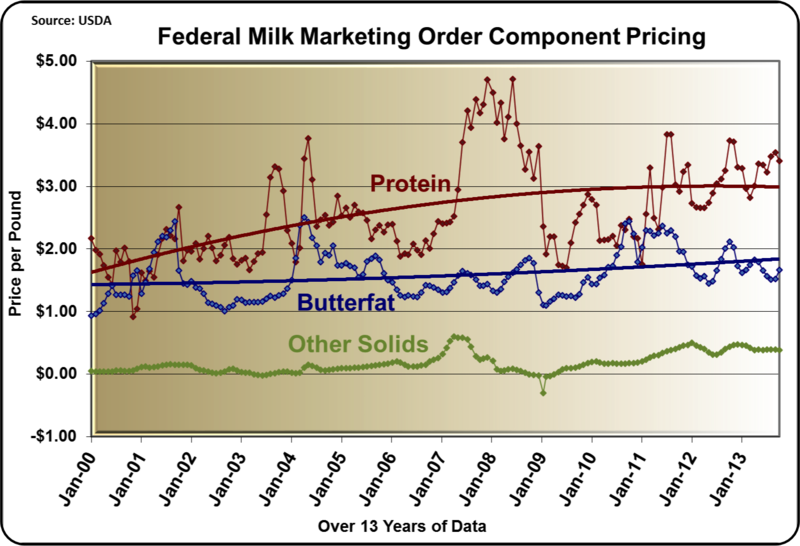 The market dynamics, with more milk going to cheese and yogurt, require higher protein milk. 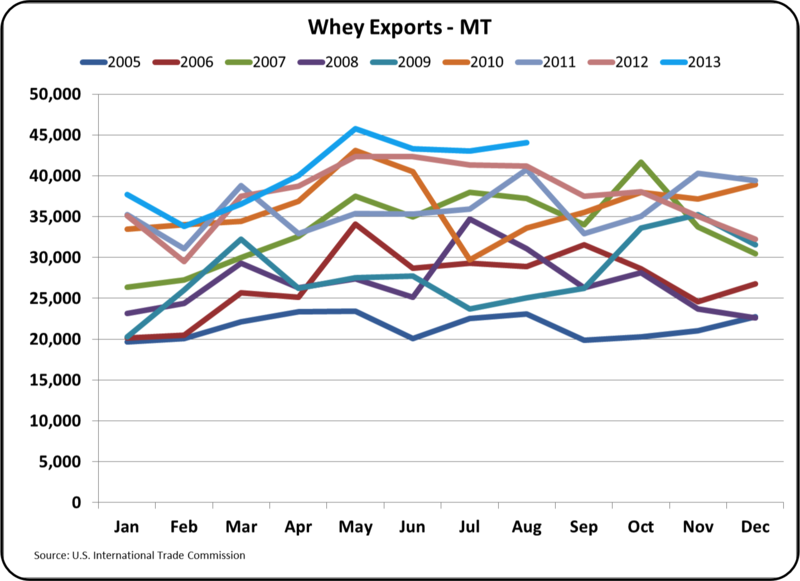 To encourage producers to produce higher protein milk, a higher value for protein is needed. At $3.42/lb. plus bonuses frequently paid for higher protein milk, producers are being financially rewarded for higher protein milk. 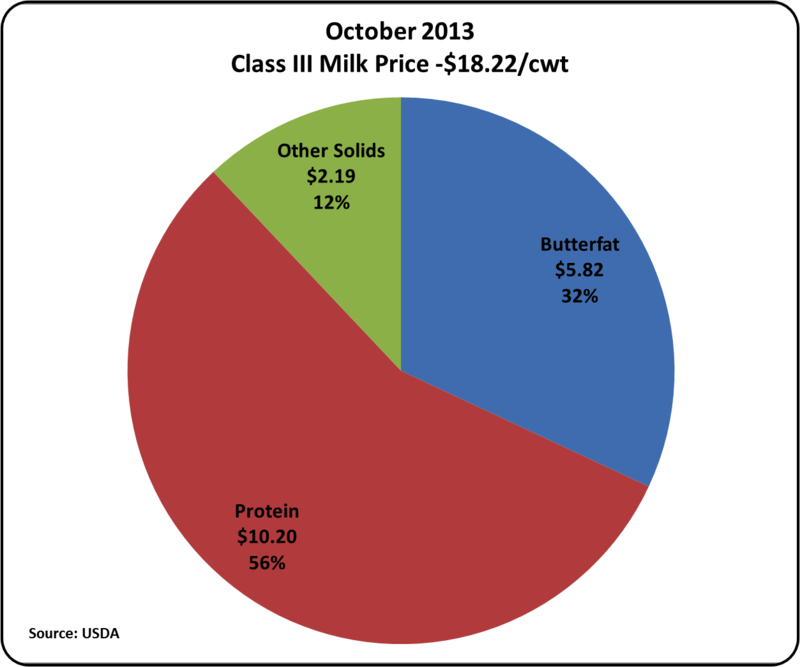 Payment for protein made up 56% of the Class III milk value. 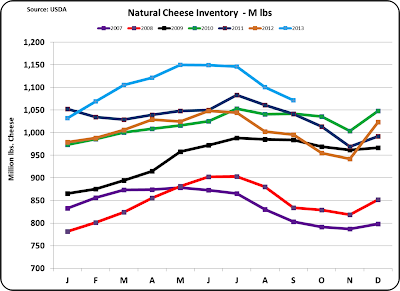 Dairy producer prices are determined by the supply and demand of cheese, butter, dry whey, and nonfat dry milk. The most important one of these by far is cheese. Changes in supply happen slowly as lead-time is required to expand herds and producer facilities. On the demand side, consumption is also slow to change. However, exports can change quickly and, therefore, are the most volatile piece of supply and demand. 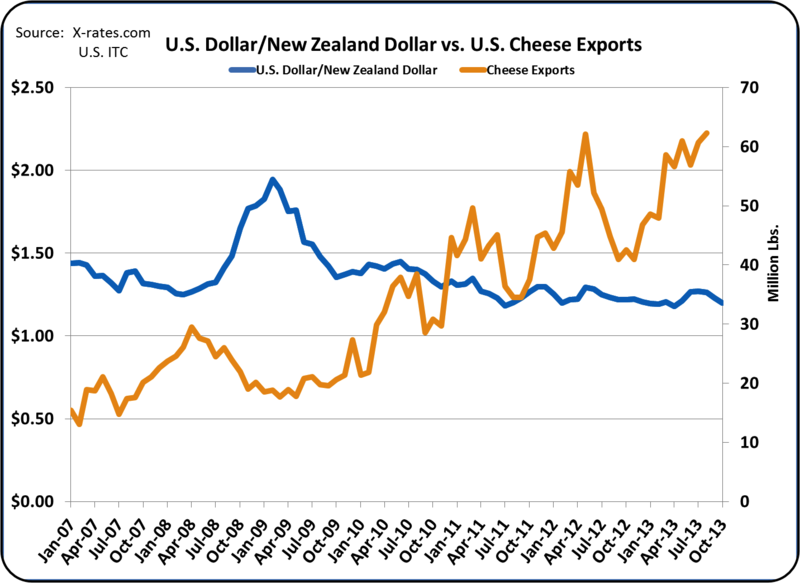 The most important current news is the recently improved trends in exports (especially cheese). 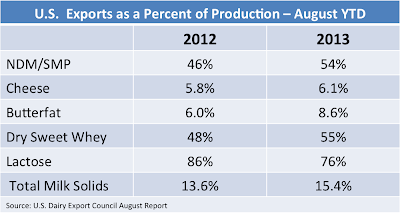 Export data is now available through August 2013. 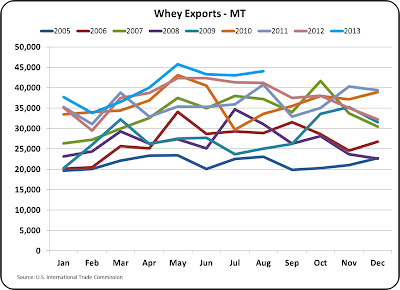 The charts and data below are from the U.S. International Trade Commission database and the U.S. Dairy Export council. 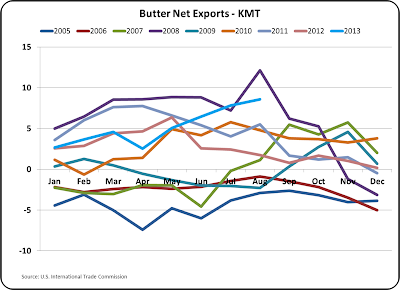 Cheese exports tracked at prior year levels for the first part of 2013 and that was troubling. However, in the last three months, there has been a significant improvement. 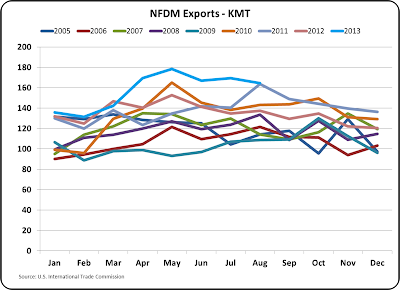 Exports reached a significant high for the month of August. 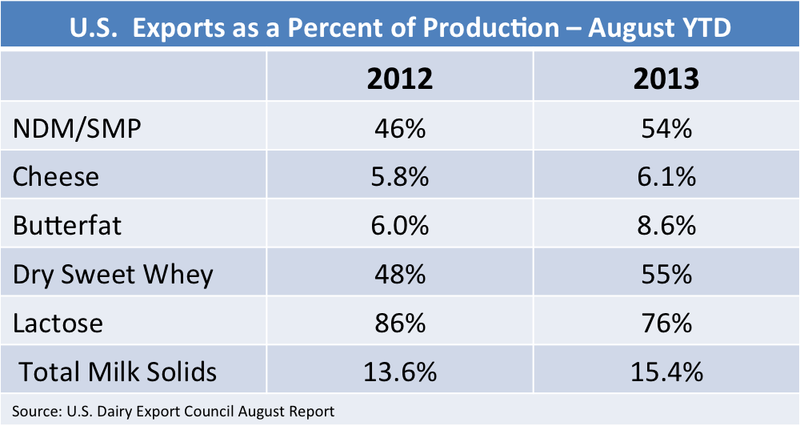 Other product export charts are shown below without comment to emphasize the overall improvement in dairy exports. The data for 2013 is consistently shown in blue. 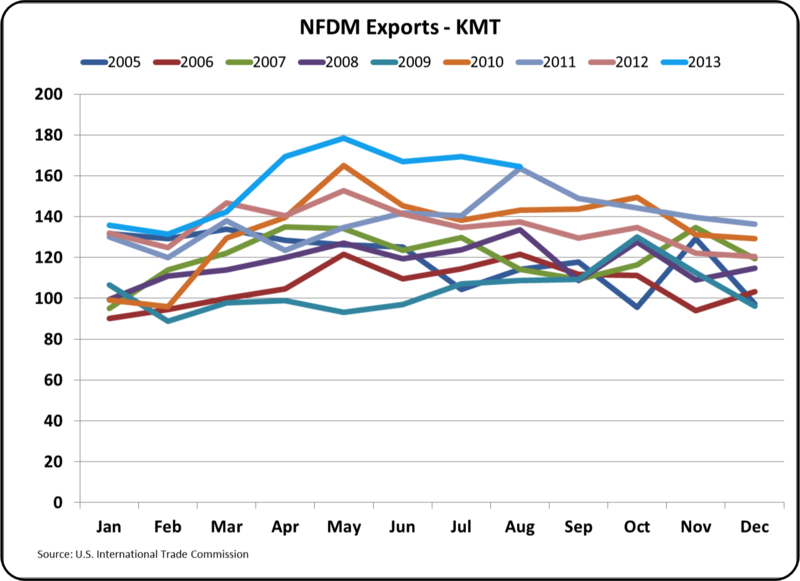 The table below shows the year to date comparisons of exports. With one exception, all items are significantly up over the prior year. 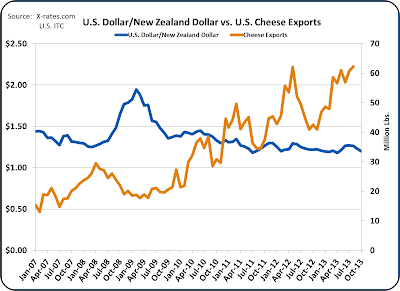 Most everyone remembers the upheaval in dairy prices in 2008/9 caused by the extreme fluctuation in exchange rates between the USD and the New Zealand Dollar (the blue line in the chart below). 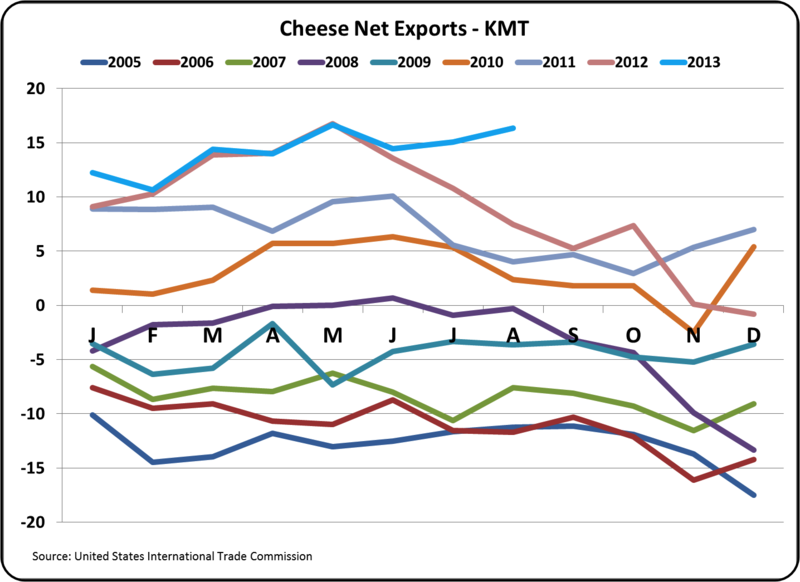 Cheese exports doubled and then crashed causing serious disruptions in supply and demand of cheese in the U.S. Dairy markets. It was a period of "Riches to Rags". The chart below shows the comparative export and exchange rates for the last six years. 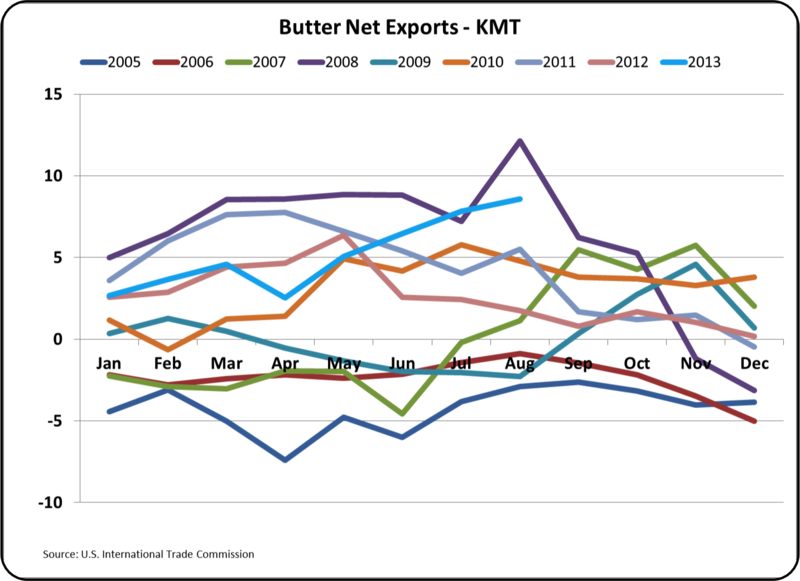 The current increase in exports has been helped with a weaker USD, but the change has been minimal and slow. 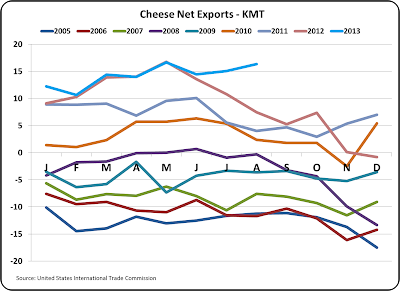 The growth in cheese exports has been a little volatile, but shows a very nice trend of increases. 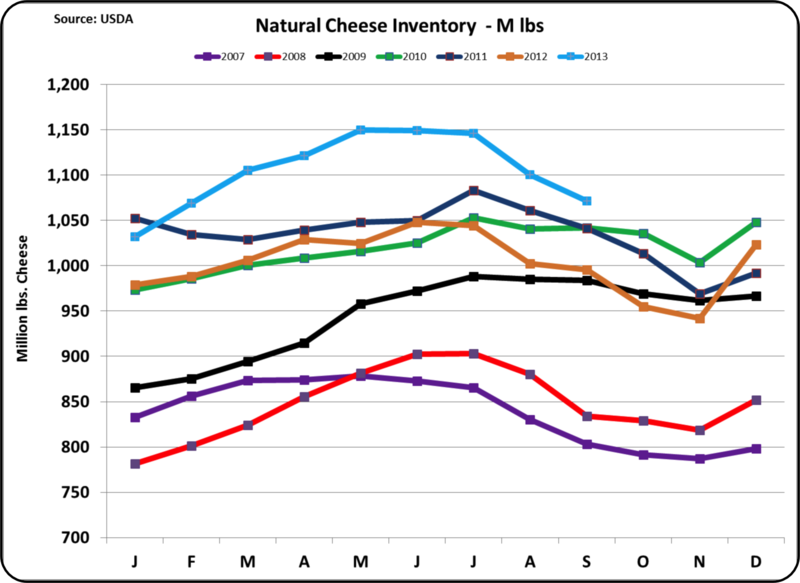 Inventories of cheese are returning to reasonable levels after a scary first half. The same can be said for butter, dry whey, and nonfat dry milk although they are not shown below. There are always new disruptive events in business, but the important supply and demand ratios are currently well aligned and hopefully will create a period of sustained stable producer prices at reasonable levels. When the current milk prices are combined with the current lower grain and oil seed prices, there is a financial opportunity for dairymen.